After a nuclear disaster caused by several terrorist attacks wipes out most of North America, residents of a small Kansas town have to come to terms with a very different reality. 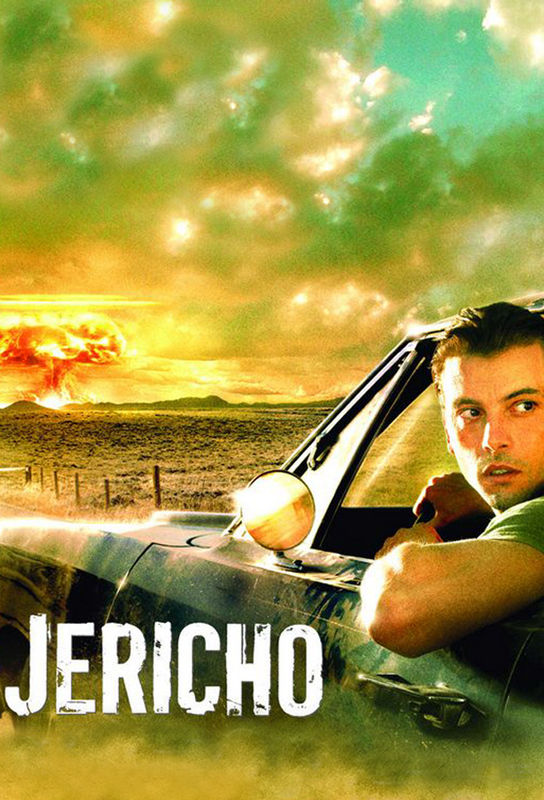 The fallout from the nuclear blast in Denver will hit Jericho in an hour and Jake has to get the residents inside. The official shelter is not adequate and Jake must find another shelter to protect them. Emily faces troubles of her own while being picked up by who she thinks are two officers. Jake finds a stranger who is sick with radiation poisoning and he must make a decision whether or not to help him. The hospital’s generator is running out of gas and the residents find that their supplies are also running low. The children of Jericho start to return back to school. A power line that has fallen causes an accident on the playground when the power returns. Jake has an argument with his mother regarding a secret that Jake hasnt disclosed to his dad. Hawkins must step in when an argument between Jake and an adversary becomes heated. After an electromagnetic pulse leaves Jericho in the dark crime runs rampant. Later, Jake is held at gunpoint and is rescued. The slick gang leader Jonah bails Mitchell out of jail and agrees to give back the food that his bandits stole and agrees to keep out of Jericho. This plan strays off-course as Jonah negotiates new terms involving Jake and Emily. The residents of Jericho receive a visit from a group of questionable outsiders and they realize that they need to form a plan to keep the outsiders out. Emily has a dream about her wedding morning to Roger. She wakes up and realizes that he is probably dead. Supplies are dropped by air into Jericho and the Greens and Hawkins think that they know where they came from. Jonah Prowse returns to Jericho causing even more trouble. Some of the residents of Jericho are concerned that Grays actions may actually make Gray the new mayor. In other news, Mitchell claims that Jonah is the killer under much speculation. The lives of Jake and Hawkins are explored during this flashback episode. This episode begins 36 hours before the bombs went off. Sarah is introduced and is associated to Hawkins. Jake had been living in San Diego. Jake, his dad, Heather and Dale visit Black Jack to try and find the parts needed to fix the windmill. Sarah goes home with Hawkins against the rest of his familys wishes. While on a hunting trip outside of Jericho, Jake, Stanley and Mimi find themselves in a dangerous situation when they run into some strangers. Meanwhile, Hawkins realizes that his family is in danger because of him. Emily and Roger work on their relationship. After a company of Marines show up, the town of Jericho has hopes that life will finally start to return to normal. However, their behavior raises Jakes and Johnstons suspicions. Roger gets desperate after Gray kicks the refugees out of Jericho. Dale and Skylar collect on some debts. Hawkins continues his quest to find Sarahs contacts. Meanwhile, Hawkins begins the process of finding whos coming after him. Jake finds that Hawkins has not been honest with the residents of Jericho about his past and holds him at gunpoint for answers. Jake believes something more is wrong after Eric doesn’t return from New Bern. Jake and Hawkins go to New Bern and discover that Jericho is in danger. The hostility mounts between the citizens of Jericho and New Bern. A handful of residents of New Bern are shot and injured after getting caught trying to steal from the Jericho salt mine. The residents of Jericho and New Bern fight over precious resources and Gray must make a tough decision after the streets of Jericho are bombed. The battle with New Bern ensues, with Jericho residents out-manned and out-gunned, but not outsmarted. Jericho gains the upper hand but suffers a significant casualty. A friend of Jakes sends help from an unexpected source.